A line forty or fifty cops long blocked the Mobil parking lot in Berkeley, MO where Antonio Martin had been shot and killed several hours earlier. It was chilling to see his body still lying covered on the ground when we got there. The horror, loss and pain felt palpable watching his body placed on a stretcher and driven away, seeing his mother writhe and cry. Along with rage, I felt some sadness and despair at the seeming endlessness of cops killing people that I more often find I detach from. For an hour or so after we arrived, various groups of people crowded around cops yelling and expressing their anger. Even as there were only around 200 people there, the police were unprepared and scared. They retreated fearfully at plastic water bottles thrown at them. The racial tensions were high between cops and people, but I did not experience it directed toward me. Black cops were often in front with white cops behind, and people yelled about black cops protecting them as if black cops were to be differentiated. People yelled at one particular black cop about what if it was his son and about how it was the holiday and so forth. I heard another black person yell that the black cop wasn’t black. It was clear to me that any yelling I would do should be reserved for white cops. One eerie interaction involved a young black person up in a cops face repeatedly yelling, “You’ll shoot me, but you won’t look at me” while the cop looked up, crazily darting his eyes back and forth or only looking down at his gloves, pulling them slightly on and off, never making eye contact. The context of the past few months in the streets was present among us. People delightfully made reference to the fact that across the street from the Mobil station was a QT. 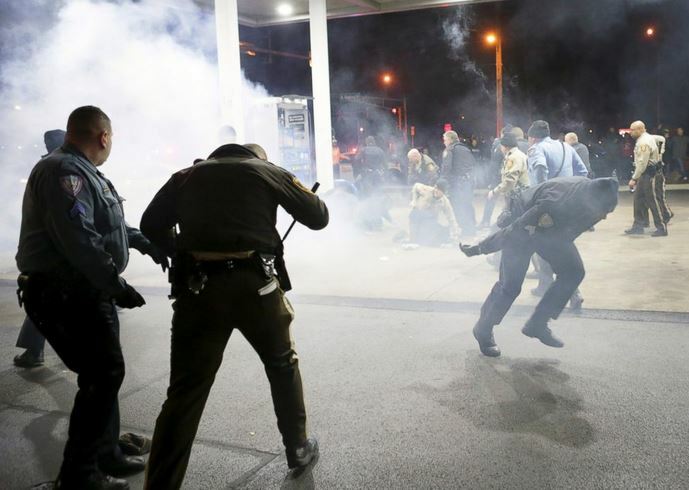 Things that happened in Ferguson were clearly a reference point for what types of responses and desires were possible. At some point the tension escalated and the crowd seemed to be in one concentrated place so that we pushed back the cops trying to hold a line. Police proceeded to try to drive two surrounded cop cars out of the Mobil parking lot, but were momentarily blocked from doing so. They were outnumbered and afraid, and damage occurred to at least one of the cars in that moment. Soon after, police released pepper spray and threw a flash bang grenade into the crowd, and in response several fireworks were thrown toward the chaotic cluster of police that were grabbing and beating several people while they were on the ground. Because of this heightened conflict, the mostly abandoned street suddenly felt open and free from police control, even as they were no more than fifty yards away. I turned around to realize that there seemed to be more police cars than there were police. About forty cop cars blocked the intersection with more cars parked side by side up the street. People began to kick and dent many of them. Several people tried to get others to help flip one of the cop cars, but there weren’t enough people. Gradually handfuls of people headed over to smash and loot the QT while leftists and other angry people recovered from the pepper spray and continued yelling at the police. This large group of angry protesters forced the police to continue holding their line at the Mobil station. If everyone had left this point of conflict at once, the half hour or so of people looting the QT may not have been possible. Someone in the median chanted, “QT! QT! QT!” and told people across the street that we needed to hold the line. 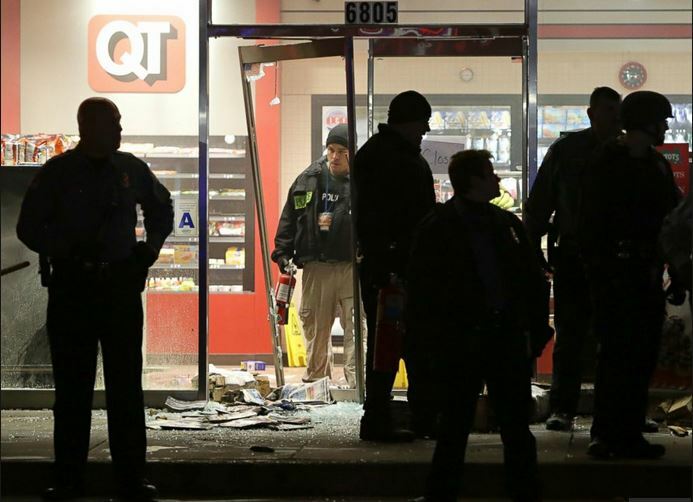 It wasn’t until people yelled excitedly that the QT was on fire that a dozen cops, some carrying rifles, moved across the street to guard the QT. By now, someone had already put out the fire, and people dispersed. With all the shared rage, the night was not entirely free from people enacting their roles that oppress their friends and the people around them. At one point during a heightened moment with the police when we were all packed in super closely to each other, a woman told her boyfriend to get his hands off her as he felt her up in the crowd while she had no way of moving. As I was right beside them, I told him to listen to her, to stop, and he laughingly shifted the situation. Carloads of people drove away with their loot. People persisted in yelling at the police. We stayed around for awhile longer, waiting to see if things escalated again until the number of people began to dwindle and then we left. It is both relieving and energizing to see the response of people to gather again where police murdered someone, creating the potential for sustained moments of uncontrollability. But remember, never email about anything illegal through any mainstream email provider. Email your submissions securely with guerrilla mail.